It's taken just about 150 years for the Party of Lincoln to become a mirror image of the Democrat Party. It's taken about 150 years for that same Party to forsake its basic principles of liberty as the Founding Fathers had envisioned liberty in the Declaration of Independence and codified into law in the U. S. Constitution. Conversely, it has taken about 150 years for the Democrat Party to become the mirror image of a so-called socialist utopia as envisioned by Karl Marx. One might ask how did this come about? It happened quite simply actually, without anyone being aware of it. First, America went from an agrarian culture to an industrial culture in the middle to late 1800's. Small cities began to grow into big cities to feed industrialization. Chicago literally blew up almost overnight when the trains came and because of its centralized location to the grain and livestock resources of the mid West. Being situated on Lake Michigan also allowed ship and barge travel to and from the Eastern big cities. However, big cities, by their very nature, create government-dependent societies and government-dependent societies become socialist societies that are easily manipulated, managed and controlled by government ..... for their votes. Those that live in big cities are eager to give up their freedoms in exchange for government handouts because they have no other way to support themselves when the going gets rough, as opposed to those who live on the land and can grow their own food. The Democrat Party, eager to gain perpetual political power, seized on that dependency and pandered to the dependent big-city population with promises of government assistance, benefits and cash payments ..... for their votes. It started with the President Wilson Presidency and then exploded under FDR with the New Deal and Social Security. It's been growing ever since to the point that six-time Socialist Party presidential candidate Norman Thomas in the early 1940's was allegedly to have said that he didn't have to run for president any more because the Democrat Party had adopted the socialist platform, or words to that effect. Every Democrat President since Lynden Johnson has increased socialism in America. Today, over 80% of the population lives in dependent big cities. In contrast, most of the independent rural American population still hold onto the vision of the Founding Fathers and are frustrated by their declining numbers and lack of influence on government policy. Just today, we talked to one of those rural landowners in the mid West on the phone that vowed to never buckle under government tyranny and they had over 60 guns in their house to back up their determination. 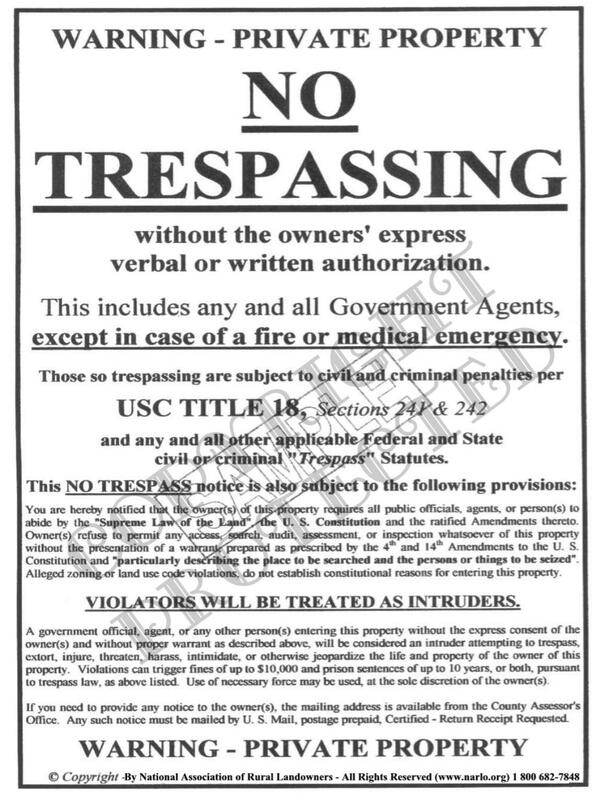 They promised to purchase our powerful, legally intimidating "No Trespassing signs" to punctuate their defiance. Sadly, the only reason Trump was able to narrowly win the election in 2016 is because he appealed to the city-dependent population in the upper mid West on one issue, jobs. That urban dependent population that voted for Trump this time will just as easily swing back to the Democrats if the jobs don't materialize. Which brings us to the rise of conservative Republican movement right after Barack Obama was elected to the Presidency in 2009. The movement has been christened with name, Tea Party. The Tea Party almost appeared out of nowhere immediately after CNBC Reporter Rick Santelli, standing on the floor of the Chicago Mercantile Exchange, called for a "Tea Party", reminiscent of the Boston Tea Party, circa 1773. His call was answered by the million-man march on Washington DC in 2009 in opposition to Obama's socialist agenda. Our organization (NARLO) was one of the national co-sponsors of that march and we received a lot of national attention that included Rachel Maddow vilifying us on MSNBC for five minutes for having the word "gun" on our website and a one-half hour hostile guest appearance on the Alan Colmes radio show. Nevertheless, the negative attention exploded our website hits to over 70,000 in one day and put us on the national map. Many conservative organizations were created during the same time period, which then led to conservative House and Senate candidates in Washington DC and in state houses erupting all across America. Obama's popularity in conservative precincts was so bad that any politician with conservative credentials looked like a good bet. This led to over 1,000 conservative legislators being elected in state houses. Democrats were losing their hold on governors and state legislators because their policies were failing, including Obama Care. But there was one draw back to the conservative, Tea Party movement. It wanted immediate gratification and an instant response to its demands. It proceeded to pressure the Republicans to swing back to conservative principles overnight and balked at any legislation that didn't accomplish their goals. But it took a hundred years for the Republican Party to get where it is today and morph into an inflexible establishment that constantly drifts in and out of the liberal ideology. It wasn't going to be influenced or bullied by a bunch of upstart conservatives. This has led to a major schism in the Republican Party that exists today. The schism has made it difficult, if not impossible, for Trump's agenda to pass through Congress. Although we have significant sentiment for the conservative movement, its goals are unrealistic. It takes over a mile to stop a loaded supertanker because of its immense inertia. It will probably take a generation to swing the Republican establishment that tends to lean left, back to the founding principles of this nation, if ever. So why does the Republican Party tend to lean left all of the time? It had no choice. As the nation moved towards an urban culture, dependency on government grew correspondingly. Millions more Americans became hopelessly dependent on some form of government assistance and were easy targets for Democrats pandering for votes. As the political climate moved left with government dependency, the Republican Party had no choice but to move left with it, if they wanted to remain a viable party. They may say they stand for all those conservative principles but in reality they are forced to abandon them if they wanted to get elected and re-elected. When Obama Care was passed in 2010, millions of poor Americans, living in big cities, became "hooked" on free health care under Medicaid. Healthy young people said to Hell with it and paid the IRS fine. However, too many older and sicker people signed up for Obama care, which completely destroyed the necessary balance of actuarially based insurance. Failure was pre-ordained and those with any intellect at all knew it well before Obama Care was passed. Unfortunately, Obama Care is now institutionalized in America's health care system and any attempts to undo it will be met with overwhelming resistance. The Democrats will have a field day with Republicans "pushing granny over the cliff", "children dying", "23 million Americans losing their health care" and crying, "tax breaks for the wealthy." We've seen this movie before. It seems Democrats don't care that Obama Care will collapse and all those poor people they champion for will be left in the dust with no insurance at all. Moderate Republicans, fearful of not being re-elected because they are in heavily dominated Medicaid districts, don't like the proposed Senate Republican Health Care Bill. Conservative Republicans don't like the proposed bill because it really doesn't repeal Obama Care. As it stands right now, the Republican proposed Health Care Bill is DOA in DC. If it does pass, it won't be in its present form. However, all of this gnashing of teeth over health care (or Russia) overshadows a much bigger problem, an unsustainable national debt that is expected to explode to $30,000,000,000,000 (that's trillion) by the year 2026, according to the Congressional Budget Office (CBO). "In CBOâ€™s baseline projections (which incorporate the assumption that current laws will generally remain the same), growth in spendingâ€”particularly for Social Security, health care, and interest payments on federal debtâ€”outpaces growth in revenues over the coming 10 years. The budget deficit increases modestly through 2018 but then starts to rise more sharply, reaching $1.4 trillion in 2026. As a percentage of GDP, the deficit remains at roughly 2.9 percent through 2018, starts to rise, and reaches 4.9 percent by the end of the 10-year projection period. The projected cumulative deficit between 2017 and 2026 is $9.4 trillion." And this is just an estimate that is very likely to be much worse. So unless the Democrats and the conservative and moderate Republicans come together, it won't matter who has health care, who is dying in hospitals or in the streets, who is being killed as armed roving gangs hunt for food in riot-ridden cities, who is being blown up by terrorists, or even who has a job. It won't matter that Russia and China could use the financial meltdown to take over America once and for all, economically or by force. A free America will have died because Democrat and Republican politicians, who couldn't agree with each other for petty ideological reasons, ignored a clear and present danger and kicked the financial can down the road for the umpteenth time. So you see ladies and gentlemen, all this political squabbling about health care, a border wall, illegal immigration, sanctuary cities, homelessness, the opioid epidemic, free trade, election meddling by Russia, or leaking of classified information, is meaningless and pointless. The real danger is a country teetering on the brink of insolvency and run-away inflation because politicians, driven by the lust for political power at any cost, promised too much to dependent people living in large urban cities. Politicians, blind to the pending demise of their nation, ignored the inescapable economic principle that every family must face, you can't spend more than you take in without going broke. Since there is no nation on earth that can or will bail out America if she goes bankrupt, America will needlessly die as a free nation, never to rise again. Don't ever be lulled into thinking that a nation can't be brought down by the folly and stupidity of its leaders ..... or the apathy of its people who let it happen. Even the Greeks and the Romans couldn't hold onto their Republics. Let us add one more thing. We do not advocate or condone violence, but if the likes of Elizabeth Warren, Hillary Clinton, Obama, Chuck Schumer and CNN and MSNBC pundits don't tone down the rhetoric against Republicans over the health care bill that Democrats screwed up in the first place, it may very well be a radical Republican nut case shooting Democrat Congressmen and women, instead of the other way around.